A summary of the news so far. 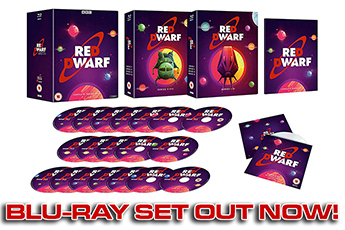 For those of you who are new to reddwarf.co.uk - welcome! For those who've come back after a while away - welcome back! No doubt the return of Red Dwarf to TV screens has you hopping about with excitement. Well, lower your other leg, stand firm and take in all the details. Those three new shows are what it's all about. A trilogy of 24-minute episodes that will bring Dave Lister and the gang right back down to their planet of origin. Showing on Sunday, April 12th will be a documentary revealing some of the behind-the-scenes work that went into the new specials. Monday, April 13th will see all three episodes, plus the documentary, repeated. Sit back and take in the whole damn thing in one convenient evening. The digital station has become Red Dwarf's new home. Chris Barrie (Rimmer), Craig Charles (Lister), Danny John-Jules (Cat) and Robert Llewellyn (Kryten) are all back! Cast in the role of Katerina Bartikovsky, former Red Dwarf science officer and rival for Rimmer's role as ship's hologram, is Peep Show's Sophie Winkleman. 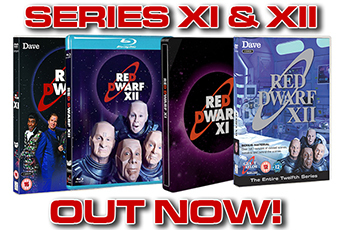 As you can see from the Dave schedule, the Easter weekend is ultra-Dwarfy, with classic episodes and outtakes being shown alongside the new programmes. Lighting, design and visual effects are all at never-before-seen levels. This production has been shot like a movie, with the production values beyond anything the show has ever had. Back to Earth will also feature several 'virtual sets' to create unseen areas of the ship. 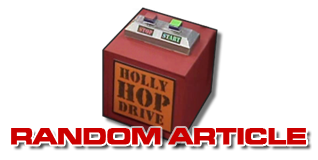 A whole new set has been created for Rimmer and Lister to crash in - and you can see more of it here. For the first day of a 14-day shoot, the cast and crew shot interiors and exteriors on the set of Coronation Street. Find out more about the day here. There are a million and one reasons to watch Back to Earth this Easter. These are just ten. Share your excitement on our Forum. Back to Earth begins on April 10th on Dave.